Foreign Language Adventure - WELCOME! BIENVENIDO! Listen to news in Spanish! Foreign Language Adventure is a Fulton County Schools authorized vendor! What is Foreign Language Adventure? 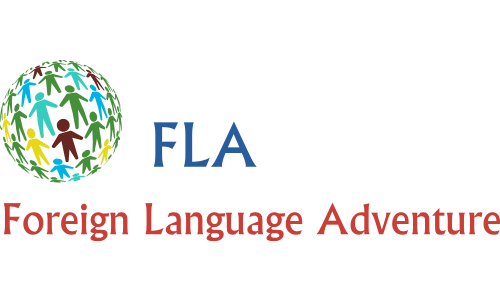 FLA offers dynamic and engaging Spanish classes to children and adults in Atlanta area and remote sites. Our classes teach a new language in immersion-based. We offer classes in preschools, Elementary schools, and private classes. Children classes: Does it work? When you or your kids come to FLA, not only will learn another language, you all will also learn an appreciation for other cultures, make new friends in the classroom, and make developmental strides that will prepare you to succeed in today's world. How much will my child learn? Of course, the speed with which a child learns a language depends on their amount of exposure to native speakers. With native speaking teachers leading our classes, your child will begin to understand words, then phrases, then sentences. They will also begin to answer simple questions, speak in short phrases and then engage in simple conversation – and be on her way to becoming multi-lingual. We recommend at least attending class twice weekly for optimal language retention. Do you need a language trainer to work at your facility to help increase your company's language capacity? Corporate Spanish lessons can be arranged at the site of your choice. Our experienced language team will work with you to customize a series of Spanish language courses and lessons best suited to the levels of your team members, using business-appropriate terminology. Our staff is well-versed in a range of professions, including areas such as business, medicine, health and social services, marketing, advertising, finance, education, tourism, and government. The course will build your foundational knowledge of the language and emphasis will be placed on conversational skills. Students will work with an experienced language instructor. If you would like to introduce us to your child's school to start a program, please contact us today. You will receive a free session. Just put us in touch with the director of your child's school, we'll do the rest. Does your school need Spanish or French Classes? Check out this fun song written and sang by Aurora Quesada, a musician from Colombia. The song is included in our newest album "Canta conmigo"